New analysis published today by the International Longevity Centre – UK (ILC-UK) Does ageing matter when it comes to workforce productivity? explores the relationship between demographic forces, e.g. rapid population ageing and the economy. Productivity growth is arguably the greatest economic challenge of our time, with the UK’s typical rate of growth over the last five years standing at just 0.2%. This paper, the first in a series from ILC-UK on demographics and macroeconomic output analyses English Local Authority data from 2001 to 2011 and finds that after controlling for health and educational attainment, the higher the proportion of over 50s in the workforce in a local authority area, the lower the overall level of productivity. The paper suggests that this may be because work suffers from diminishing returns: that for every additional year worked, there is a relatively smaller gain in output. 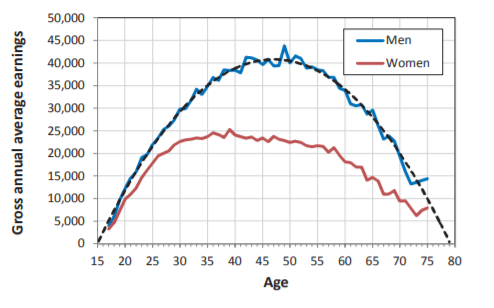 It argues that whilst rising life expectancy and other factors might raise the age at which productivity peaks, the broad shape of a worker’s lifetime productivity curve is likely to remain meaning that a higher share of older workers will likely drag down overall levels of productivity (see figure 2). The paper suggests that lifelong learning and retraining could result in changes to the gradient of a worker’s lifetime productivity curve, helping to slow the speed in decline in productivity growth as workers supplement old and potentially obsolete skills with new ones. The paper also finds that while the age of the workforce seems to drag down overall productivity, an increase in the proportion of over 70s in a population has the opposite effect. 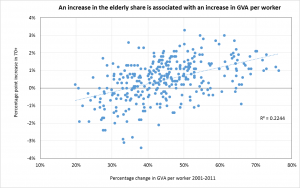 Those Local Authorities where the proportion of people aged over 70 increased the most also saw larger average increases in productivity per worker, with the share of people aged over 70 being the only statistically significant variable. The paper suggests that this increased output may be the result of restrictions in labour supply making investment in capital relatively more attractive and innovation in the workforce, e.g. automation more important. ‘With reference to English Local Authority data, this report provides support to both prevailing conclusions in the economic literature regarding the impacts of ageing on productivity. An older workforce may be a drag on output, but an ageing population could raise the rate of productivity growth. In any case, investment in education and health are likely to remain critical drivers of long run productivity. 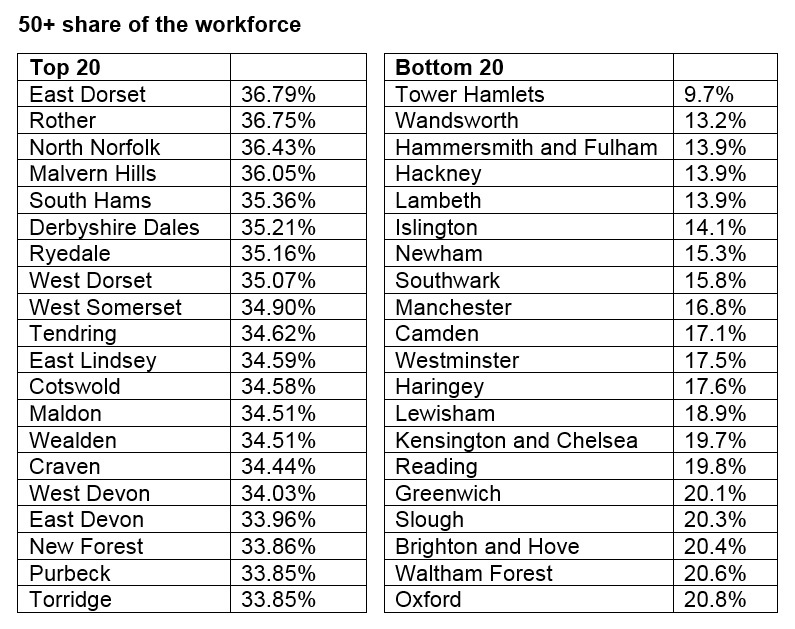 Both are strongly correlated with the productivity performance of local authorities in our analysis, and focusing on the health and education of the workforce, irrespective of age, is therefore likely to support higher levels of economic output’.